Below are recent news excerpts translated with permission from the Armenian newspaper, AGOS (http://www.agos.com.tr/). Mr. and Mrs. Herman Hintiryan have been frequent visitors and supporters of the Terchoonian Home, and are recognized by many of the children. In a recent trip, they brought the children a bicycle. However, before the children could enjoy their new bike, the overgrown grass around the building needed to be cut. 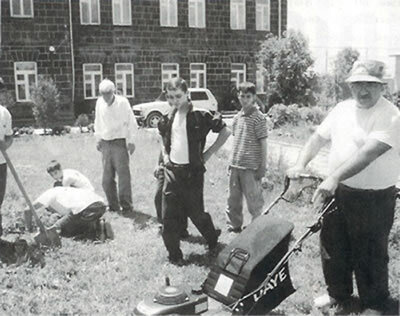 Mr. Hintiryan traveled to Yerevan to purchase a new lawn mower. He also taught some of the older children how to mow the grass and maintain the lawn mower. 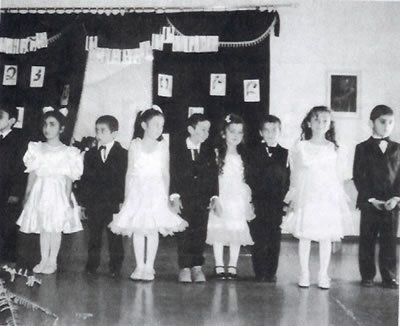 A group of first graders are shown at the end-of-the-school-year celebration. They are proud to be able to read and write on their own.